Swing Zone features six golf simulator bays that accommodate up to 6 players each. The bays are rented by the hour and each person is charged an hourly price. Individual simulator bay rental is capped at the price of a foursome. If there are five or six players in a party, there is no charge for the 5th or 6th player. On average, it takes about one hour for an individual to play 18 holes. For each additional player, add one hour. Minimum rental time is 30 minutes. No golf clubs? No problem. You can borrow ours! Full sets of Titleist golf clubs for men and women, plus kids clubs are available for your use on-site. When booking your tee time, please let us know if anyone in your group will need loaner clubs so we can make we’ll have some available for your tee time. Have more questions? Please visit our FAQ’s page. Know someone who loves golf? 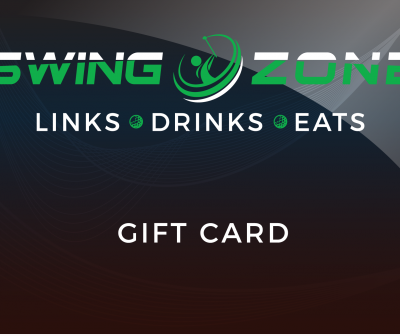 They would love a Swing Zone gift card. Gift cards can be used for simulator time, food & beverages, lessons and club fitting.